Note: The photo ID, bar code email, and name assigned to your ticket must match. The on-site BlizzCon Store will be open a day early starting on Thursday (9am to 9pm). Head to Hall E and pick up some swag before the show begins! Note: Once a bar code is scanned and the associated badge is printed, the bar code becomes invalid. We will not reprint lost badges. If you don’t know who you are purchasing tickets for, enter your own full name and email address for all tickets. 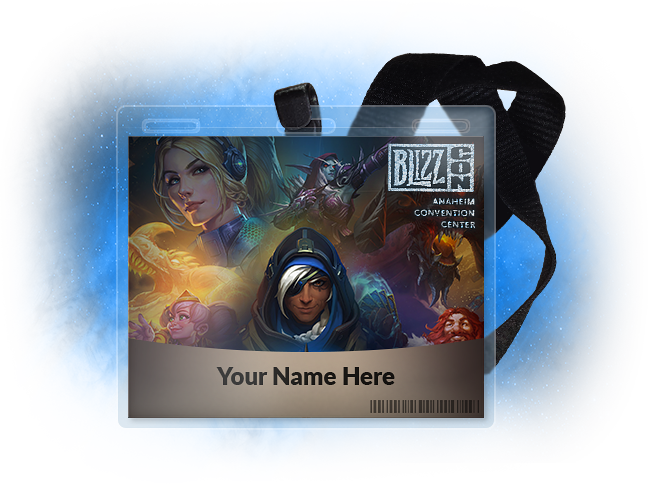 In this case, the ticket purchaser must bring all of the printed bar code emails, along with matching photo ID, to BlizzCon to pick up badges. While all of the badges will show the ticket purchaser’s name, photo ID will only be checked at the time of badge pickup. Note: If you change the name of an attendee for a badge, only the emailed barcode and valid photo ID bearing the name of that attendee can be used to claim their badge. A confirmation email without a barcode will not be sufficient to claim a badge. You must have the barcode. Barcodes will be sent out at a later date. Bring your bar code email directly to the Solutions Desk in Hall E, along with the original credit card used to purchase the ticket and the purchaser’s original photo ID (digital copies will be accepted; front and back of credit card required). To avoid a trip to the Solutions Desk, enter your own name in place of the minor’s attendee information. This will allow you to pick up the badge with your own photo ID, and then you can give the badge to the minor accompanying you. Accompanying adults must also purchase a BlizzCon ticket to enter the event. For accessibility information and services on-site, please visit the Accessibility desk in Hall E, located next to the Solutions and Name Change desks. For more information on accessibility online, visit the Event Rules and Details page. Visit the Solutions Desk for further assistance on ticket- or badge-related issues at the show.